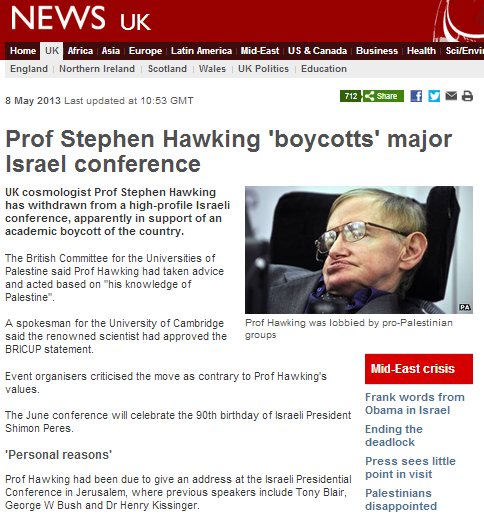 The BBC News website’s Middle East page is running an article claiming that Professor Stephen Hawking has been persuaded by an anti-Israel organisation to boycott a conference in Israel. “UK cosmologist Prof Stephen Hawking has withdrawn from a high-profile Israeli conference, apparently in support of an academic boycott of the country. Embarrassingly for the BBC, its habit of taking statements made by politically motivated NGOs at face value – and publishing them without sufficient fact checking – appears this time to have backfired. Our friends over at The Commentator did do some fact-checking however. One trusts that the BBC will be issuing an immediate apology to all concerned, as well as conducting an investigation into this breach of its own editorial guidelines on accuracy and impartiality. Update: It now seems that within the last few hours, Professor Hawking’s spokesman has done an about turn. The following link is from the University of Cambridge news site. Egg on the face of the BBC. I expect that Brainwashed Bullocks Confabulators will try to obfuscate their responsibility as much as possible. like some primadonna he says yes and no and yes and no. who knows what’s in his head? A very sick, elderly scientist who cannot move, and who cannot talk without a machine accepted an invitation to a conference in Israel. 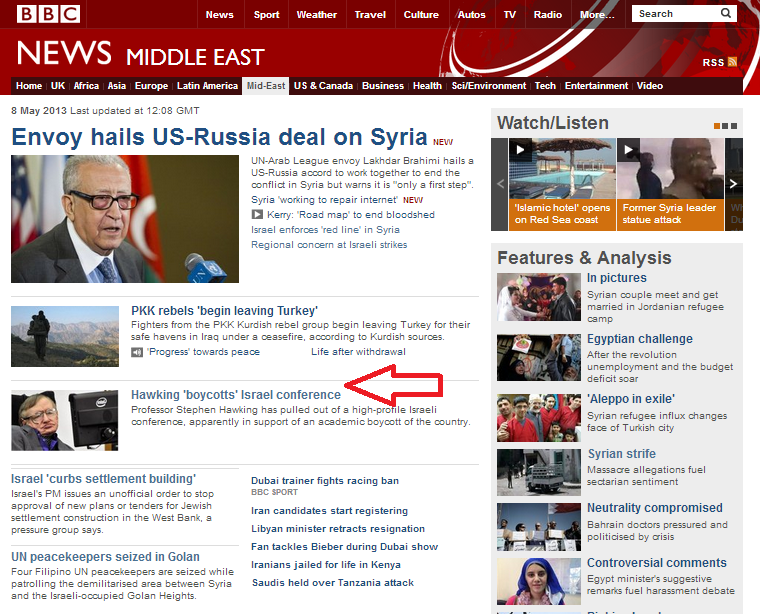 And later declines that invitation – apparently after pressure emails and advice from Palestinian colleagues. All I can say is that I really hope no one ever mentions the Jewish/Israeli lobby to me again. (fat chance!) From this incident it seems to me that the so-called pro-Palestinian folk are pretty able lobbyists themselves. I wonder…..The subject of Mr Hawking came up in conversation at work a few months ago, and a colleague of mine (a very mild mannered, self effacing type), told us he’d once walked into a bookshop somewhere in southern England (I can’t remember exactly where) just as Stephen Hawking was exiting. Mr Hawking’s wheelchair ran over his foot, and he’d gasped with pain. “Did he say sorry?” I asked. “No” my colleague replied. “But his voice-thingy said “Get out of the f***ing way”.”……..
Perhaps he’s not quite the poor wee victim one might imagine! There’s no way of knowing, Yorkie. Thus far, though, I’ve read of Chomsky, Palestinian colleagues and a bombardment of emails “persuading” Hawking not to visit Israel. I just can’t see why a man of Hawking’s talents and standing would involve himself in petty activism now – at this stage in his life and in respect of a country he’s visited before. Don’t eat it, Pennylan. It will only give you indigestion. Throw it under the wheels of his chair, instead! He could’t fail to register your protest then – but be prepared to be sworn at, I guess. I picked up a copy of the Daily Mail from the train seat on my way home yesterday, In which there was an interesting article about Hawking and his recent ‘decision’: turns out his voice- synthesiser uses an Intel chip developed in Israel: I wonder how far he proposes to take this BDS thing in the end – probably not all that far, eh? In an exclusive interview with the Guardian, the cosmologist shares his thoughts on death, M-theory, human purpose and our chance existence Stephen Hawking dismisses belief in God in an exclusive interview with the Guardian. There’s a real irony about just who Hawkins has chosen to champion, and those who selected him to champion them then. I just wish he will take a trip to the Palestinian territories and tell them about his view of the world – :and them, based on it. Then we’ll see if he’s afraid of death.